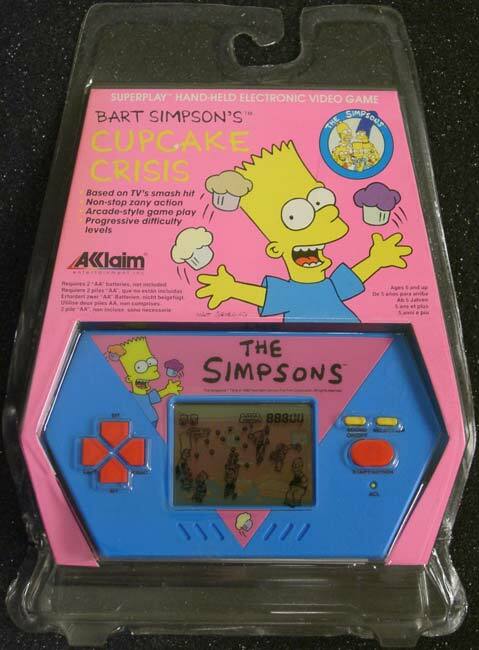 Bart Simpson's Cupcake Crisis is a handheld video game released by Acclaim in 1990, produced in 1989. The only other Acclaim handheld is Bartman Avenger of Evil. "Aye, Carumba! Bart's really got his hands full this time... with cupcakes! Maggie is throwing 'em as fast as you're catching 'em. You've got to be quick and get them over to Marge, because before you can say "Whoa, Mama! ", Homer and Lisa get in on the action - creating all-out Simpsons mayhem!" Modified on February 9, 2012, at 17:19.